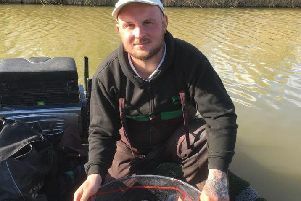 Deeping St James AC fished the Cedar Pool at Decoy Lakes for the Club Cup on Sunday. The winner from one of the fancied corner pegs was Tony Johnson on peg 26. He fished the short pole at the bottom of the first shelf fishing dead maggot over caster for a total weight of 195lb 6oz. Second was Colin Fisher on peg six with 146lb 14oz, he also fished the margins all day switching between meat and maggot, and third was Brian Johnson on peg 22 with 91lb 8oz. Fenland Rods were back in action on Sunday at Head Fen Fishery. Unfortunately many of the club members got caught up in the very popular Cambridgeshire cycle run and had to make several detours to get to the fishery and even more on the way home. On the fishing front, it was Tony Nisbett out in front with 100lb 8oz. He caught down the middle feeding and fishing pellet. Second was Mel Lutkin, who caught on meat under a tree for 98lb 14oz, then came Dave Garner on 89lb 14oz. It was much the same in the £1,000 qualifying open match at Rookery Waters on Saturday with some cracking weights followed by some poor results. Matt Wiles from peg 31 took the honours with 137lb 15oz. He caught fish up in the water with 6mm pellet on the hook to just edge out Jake Gill from peg 37. He fished exactly the same as the winner to put 133lb 9oz to the scales. Third place went to Steve Hayward on 114lb 9oz. Next Saturday’s qualifying open will be fished on Jay and Magpie (draw 9am fishing 10.30-4.30pm). Everyone is welcome. Contact Alex on 07824878492 for all the details.